Time sure flies! Its hard to believe that two years have passed since I last posted anything here. Life does what it usually does...move on. Its been a busy season in our family going from full time home schooling to having graduated our last child. What in the world will I do with myself now? --- Oh yes, gardening and blogging again! I am really looking forward to start a new season of life when I examine all I have to work on that I never could before. I have plenty of projects to finish and lists to check off. Focusing on what has worked over the years and tweaking it to run more efficiently is the plan. Last fall, my gardening friends and I took a trip to visit the Dallas Arboretum. Talk about inspiration to try new things! Since its local for us, I can take good information away from there about what plants will grow in my area. It saves both time and money when you consider this. Sometimes its not that you are a bad gardener, but you have chosen plants that are not suited for your climate. Even the arboretums have trial gardens for this very purpose. They test plants to see what will thrive and what will not. I like to look at my own garden experience through that same lens. I run my own trials per say. Choosing the right plants under ideal conditions can vary from yard to yard. Micro-climates, pests, flooding, wind etc can make a difference. I will get into the details of my own experiences and changes here soon. Good times are ahead and I am looking forward to a "fresh start." We are taken through an intense course over 11 weeks here and are required to pass an examination at the end and volunteer for 50 hours over the first year. ** Some counties require additional things/hours. After the first year is completed you then are a certified Texas Master Gardener. To keep your certification a certain amount of volunteer hours and training are required each year. Its very easy to find yourself with several hundred hours in a year with not a lot of effort. Time really flies with the variety of options that are available. Information given out HAS to be research based. No home remedy solutions, herbs medicinal qualities, some types of organic practices, moon phases effect on gardening etc. We teach and advise. Oftentimes we get requests to come work on projects. The problem is there is just not enough time and we are not paid. We will be happy to pass along information to help. All of these trained people are called on for certain questions and also they provide training on a higher level to fellow Master Gardeners. Outside of that, we have Master Gardeners who are better at some things than others. I immediately know who to go to if I have a question on herbs, for example. That person may not know much about perennials though. Its just how we all work together. The Master Gardener program in our county (HUNT) is considered a smaller one compared to counties like Dallas. We still are able to donate around 5000 volunteer hours to our county per year. This is a HUGE savings to our community and state as a whole. We have volunteered by taking calls at our Extension office, made house calls to help diagnose problems and traveled to give presentations to groups. We also can be found teaching school children through JMG at several local schools, churches, and area groups. We also maintain a demonstration garden with plants that are recommended for our area. We are happy to answer questions to those who ask. Its great fun and I am constantly learning something new from our group. We share plants and seeds among each other regularly which makes for a wide variety of plants for everyone. We do all of this as a not-for-profit organization that does all of their own fundraising to pay for many of the programs we offer. I may not know everything about certain types of gardening, but I'm trained to know how to find it. If I don't know, then I pass along my questions to the experts who do. Gardening and everything that goes along with it a lifelong pursuit of learning. That's what keeps it interesting and keeps us growing! I never thought those words would come out of my mouth. I've had Morning Glories as one of my most faithful flowering vines around here that produced an abundance of blue flowers that were show stopping. With reseeding easily from year to year I just knew I would have plenty this year. The joke is on me. I have a couple of struggling vines that came up really late this season and I'm not expecting a show from them by any means. That's just the way it goes sometimes! I am going to make it a point to replant Morning Glories next year. I will be back in business then. It sure feels like summer has been here for awhile in N. Texas. It's a bit surprising to me for some reason that today is only the first day. The temperatures and dryness levels are the normal we usually see in July and August. But for today we get a reprieve. We're only suppose to get to a high on 91 degrees today and that will feel amazingly nice, especially with the 1/2 inch of rain we got early this morning. Hopefully the plants are refreshed and we will continue to see more rain through tomorrow night. Here's to hoping! High fire risk alerts are all around us right now. The wind has been really strong and hot over the past week, causing everything to dry out at an alarming rate. I've been manning the water hose trying to keep everything alive around here. I'm not going to complain though because we are actually in better condition here than most of Texas. Ranchers are selling off cattle left and right because there isn't any grass growing for them to feed on. Lakes are way down in most of the state where many residents depend on for drinking water. So any rain that comes is way more than welcome here! According to the Keetch-Byram Drought scale, we are in the green area which is hanging on by a thread to stay out of the drought conditions. One more step on the scale and we'll be there. Hopefully with a bit more rain we can keep ahead of it for a little while longer. We moved onto this property the last year of the big drought in 2006. We were desperate and on water restrictions. The ground was like concrete and the cracks in the soil were big enough to break a dog's leg if it slid off into them. Moving into our home was interesting that summer. We had quite a challenge in installing our privacy fence in the back yard. We rented an auger to drill the fence posts and it wouldn't go down more than 3-4 inches into the soil. Even trying to soak the ground didn't help. We ended up hiring someone who dug holes for foundations. He had a tractor with a strong auger attachment. The ground was like concrete and dry as a bone 18 inches into the ground. Since then we've had years with plenty of rain and we added a lot of foundation planting and trees. We're hoping that we can maintain everything through this drought. The soaker hoses will be our key to keeping everything alive and use the least amount of water we can. We haven't installed drip lines yet, but that will be in the mix soon as another project we need to do. With world hunger and a need for local food production, teaching gardening skills to starving people is a must. I try to envision trying to garden with what I have around me only in the process. In the U.S. we have the luxury of garden centers, nurseries and basic clean running water. Keyhole gardening offers plain smart design. Using a composting basket in the center allows for a constant feeding of nutrients and water to the garden. Grey water can be recycled from household daily use and poured straight into the center creating zero waste of drinking water. With the nutrient dense soil more food can be planted in a smaller space and not waste water and resources. The design seems simple enough that a garden could easily be constructed by most households and communities. I would like to build one of these myself. This video is one being built in Uganda. This design can be adapted to whatever area you live in. Rocks and boulders may be used instead of brick. Freecycled material may also be an option for those of us in the U.S. for material. It would be great not only to be able to use this to grow our own food, but learn the skills so that we may be able to help others no matter where they live. I was reminded the other day about a popular question among gardeners. Do you wear gloves? Many gardeners like to get their hands in the dirt and its part of the fun of it all. 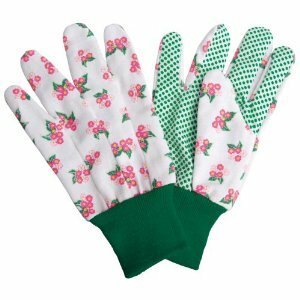 While others take pride in the type of glove that is their favorite and they wouldn't garden without them. Rose pruning, thorny branches and heavy work where a good grip is important. I keep a pair in my car to carry cinder blocks and building materials home. I never fail to have an occasion when they've been important to have around. My hands aren't always the strongest and the leather gloves give me that extra help I need with grip also. Oh, and I will take my chances dealing with a snake with these also. 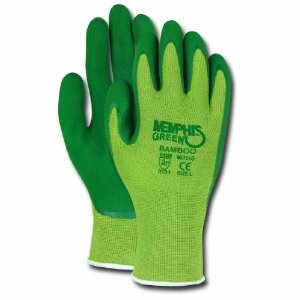 Pulling weeds is the main reason I love these gloves. 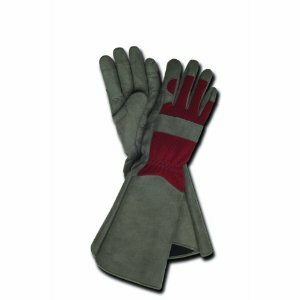 Getting a more form fitting glove such as these helps with accuracy in getting the weeds next to plants without grabbing part of the desired plant with it. I feel like I have surgical precision when using this type of glove. The added rubber grip allows me to pull weeds with much less effort and keeps my hands from getting as tired. Good for all purpose gardening applications. I plant flowers and pick vegetables using these. They provide the needed protection from insects I need. Organic gardening can leave you with spiders, wasps and bees hidden in garden beds. They are there to help and its hard to see them sometimes. Having on a pair of gloves helps me to reach in with a bit more confidence that I'm not going to get bitten or stung. They wash up easily and are extremely comfortable to wear. I use these for a wide variety of applications. I carry buckets, pick up boards and deal with animals using these. I like the band that fits snug around my wrist with these. If I place my hand in something with fire ants in it, I stand a chance of knocking them off before they crawl inside my gloves to sting me. 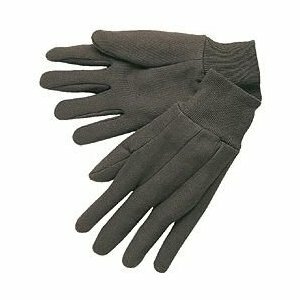 I buy these gloves in bulk because I go through at least one pair a day. I often have to change them out a couple of times in a day if I get them too muddy or nasty. They wash up beautifully and are ready for the next time I need them. I have a bag that I keep my gloves in ready to go. I like this because if I wear one glove out I can easily pair it with another and not miss a beat. Each type of glove has its place in my daily gardening chores. I'm also thankful when my husband compliments my hands and can't tell that I work outside each day with them. No calluses here and I can thank my gloves for that. 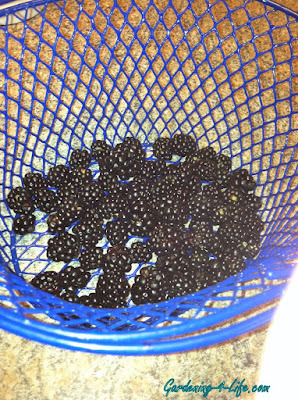 Blackberries have been coming in a little each day over the past week or so. Its not been enough to make jelly or a pie yet. An easy way to preserve berries is by a term called flash freezing. By spreading the berries out in a single layer on a cookie sheet or baking pan and then freezing I can then transfer them to a freezer container until I have enough to make what I want. Flash freezing also keeps the berries from crushing each other and end up being a solid block of juice and berries. 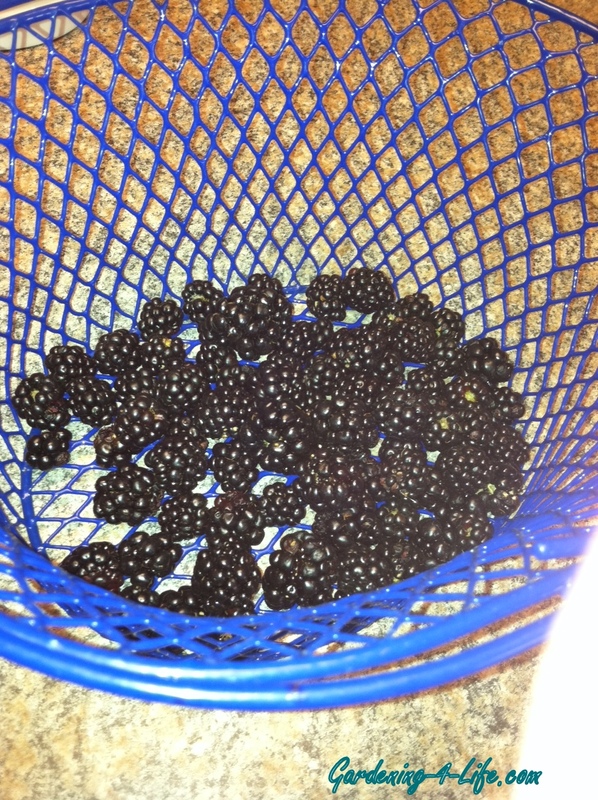 Since they are individually frozen the berries will pour out of the freezer container easily. I personally like to save some of my jelly making and pie baking for cooler weather. Its just way too hot outside to heat up the kitchen right now. By flash freezing the harvest now, I can put off that job until both the weather and my schedule are more suitable for inside chores such as this.